We are very excited to announce the largest expansion of our collection yet! Six new pashmina designs arrived a few days ago and are now available for viewing on our website. Here’s a little bit about each new design and its inspiration. Click the name of the design to learn more and see more photos. (Seen above.) A bold, colorful design inspired by the spotted pardalote, also known as the diamond. The pardalote is one of the smallest birds in Australia and is very difficult to locate. A seaside look inspired by the dalmatian pelican native to Eastern Europe, a majestic bird and the largest living creature that can fly. In Egyptian mythology, the pelican symbolizes death and the afterlife. A modern take on a common motif, this design is inspired by the striking and delicate wings of a butterfly. Butterflies use the bright colors on their wings as a source of identification. An elegant and sensual pashmina inspired by the tentacles of an Octopus. The tentacles of an Octopus serve as sensory organs and a way it can touch and feel its way around the ocean deep. Inspired by a pair of potted plants given to Barsha by her mother-in-law and currently sitting on the mantel of her living room. The names are homage to Thing 1 and Thing 2 from Dr. Suess’, The Cat in the Hat. 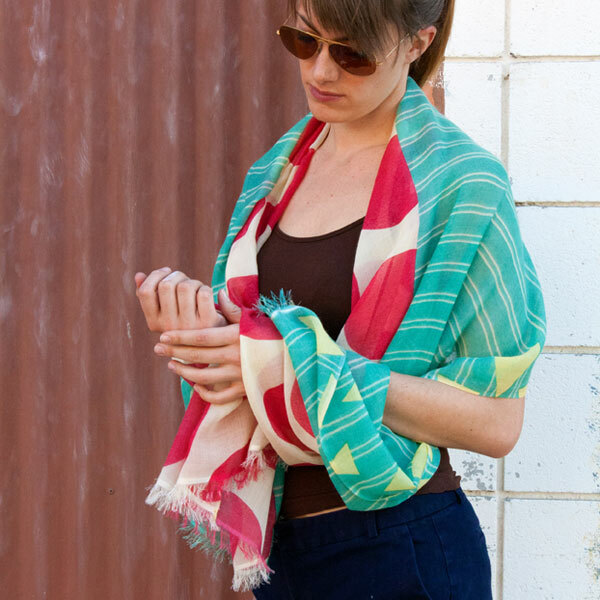 View our entire pashmina collection here.